When climbers go on long expeditions, they have to carry everything that they will need to live- all their clothes, food, and climbing equipment- for several weeks on their backs. They end up carrying very heavy bags on their backs. 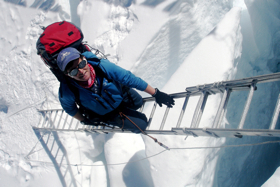 Sometimes when climbers are working out or training in preparation for an expedition, they will do their regular training (such as a step class) wearing a heavy backpack. Objective: Expose students to carrying backpacks during physical activity. a couple of empty backpacks, any size. Instructions: This is a simple tag game. Choose a few students to be ‘it’ (depending on the number of backpacks you have and/or the number of students in the class). These students will wear a backpack on their backs. When they tag another student, they will give them the backpack and that student will become the new ‘it’. Students will enjoy the novelty of wearing a backpack in physical education! We played this game today in P.E. Zach said he could imagine you (TA) with the backpack on your back when we played the game. When we played the game, Coadie found the backpack to be falling off his back and wonders if that happens to you. Anthony is realizing that it must have been very difficult to go up and down signal hill dragging the tires. The class just realized that it is about 1:50 pm here in St. John’s, NL, and it is about 10:10 pm where you are. We are also just realizing that it is about 5:30 pm when you post your audio posts and pictures and we get them here around 9 am NL time. Hope you have a better day today TA and hope this message finds you well.